Lyle: Hello! Just want to remind you to check your tuning again. It's a good habit to get into. Lyle: The Heavy Rock style guitar relies almost exclusively upon the tight and “powerful” sound that the power chord produces. Power chords definitely sound good with any degree of overdrive/distortion added to the electric guitar sound although you can play them on acoustic guitars too. They are made from at least two different notes player together harmonically, the root note and the perfect 5th degree above it. That means the first and fifth note of the major scale played together. Lyle: The hard part for some beginners is getting the 3rd finger to reach up far enough to make it sound right. dyim417: Can I use my pinky? Lyle: Yes you can but I'd rather you learn to use your 3rd finger. Lyle: You can make a C5 power chord almost anywhere on the guitar, just find a C note and put your 1st finger on it, then go down a string and up two frets to locate the "5th" degree. Then strike both notes together to make the power chord. Lyle: Here's a whole bunch of C power chords around the neck. Notice the "shape" of the power chord is different when you start on the 3rd string and add the 2nd string. This is because of the way the guitar is tuned. dyim417: Should I strum power chords up and down like normal chords? Lyle: Mostly a down stroke is used. For fast rhythm you would use down and up. Lyle: If you playback the TAB file I just posted you'll see the note names on the virtual neck. Lyle: Speaking of simple, here's a progression for you to try using power chords. Lyle: 4 beats to each measure. Hit the power chord once on beat 1 of each measure. You'll have to hit the E5 on beat 3 of the 4th and 8th measure. Lyle: Make sure that when you play the power chord, that both the 6th and 5th strings are being heard clearly and equal in volume. All the other strings should not be heard, they should be muted. Lyle: This is the same progression used in the song 25 or 6 to 4 by the band Chicago, also by the Pop/Punk band Green Day on one of their hit songs. Lyle: From my experience working with many beginners over the years, I find the beginning guitarists sometime have trouble getting their 3rd finger to hold that power chord shape. Lyle: This results to an incomplete sounding power chord, the root note may be the only note heard. Try to make sure you hear both the 6th and 5th string together to make the power chord sound. Stretch that 3rd finger up to reach two frets higher at all costs! 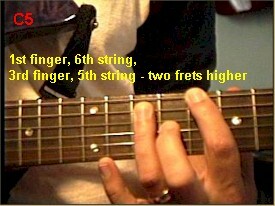 Tim: I find it easier if I place the third on the fret first then stretch the first finger. Lyle: That's a good idea Tim. dyim417: Did Nirvana use power chords? Lyle: That's the one that did it for me. I learned everything there is to know about power chords from the Black Sabbath band and their guitar player Mr. Tony Iommi. Lyle: I have a power chord test for you to work on. 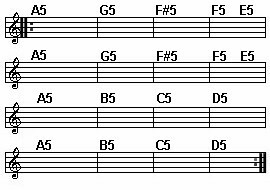 Here is the chord progression chart and a looping jam track. See if you can figure out how and where to play the power chords using the 6th string as the root. I'll put the TAB answer at the bottom of this lesson. Lyle: Your goal for this lesson is to be able to play all the power chords up and down the neck using the 6th string as the root, making them sound good in the process by making sure both notes/strings are ringing clearly. Play all three of the progressions and get the power chord test under your fingers. Tim: Thanks, Lyle this has been awesome! Lyle: You're welcome! In the next lesson you'll learn and practice power chords using the 5th string as the root. Lyle: Let me know if you need help learning a riff or your favorite song. I can custom make the lesson for you using this software and send it to you so you can download it to your hard drive. Email me at Lyle@theguitar.net for more info and to send me your custom private lesson request!